Finally we are ready to present Adguard for Android for everyone to see! Please note that this is not a release yet, only the open beta version available to everyone. It may contain bugs and we would be very grateful if you let us know about them. In this post, we’ll tell you in as much detail as possible about how it works and what it can do. Needless to say, Adguard for Android excellently blocks all browser ads. We are proud to say that before us there’s been no product for Android with such a quality of blocking. The program includes two filtering engines. One of them is focused on quality, and is identical to the engine, which is used in the Windows version. The second one is designed specifically for Android and is focused on fastest filtering at a small loss of quality. Now, to specify for those interested in writing the rules – quick engine does not support HTML content filtering rules. You can change the filtering engine you use in the advanced Adguard settings. Browsing Security module is one of the most important components of Adguard for Android. We are aware of more than 1.5 million phishing and malicious websites, and we constantly update our database. 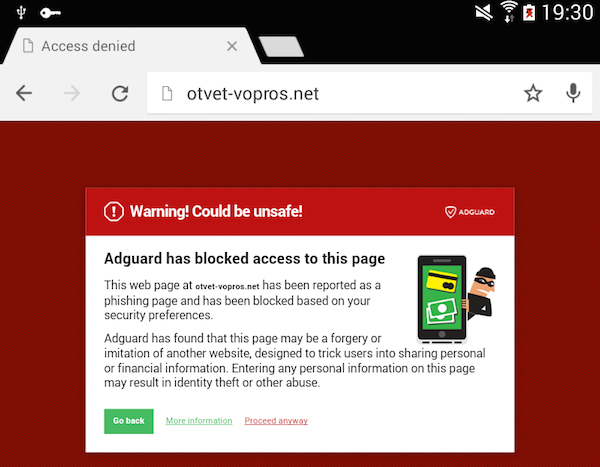 Adguard checks all web pages and apk files being loaded. If we have determined that a website or an app can be dangerous for you, the loading will be blocked. Adguard provides two filtering options for your choice: local VPN or local HTTP proxy. In advanced settings you can switch to the one that suits you more. 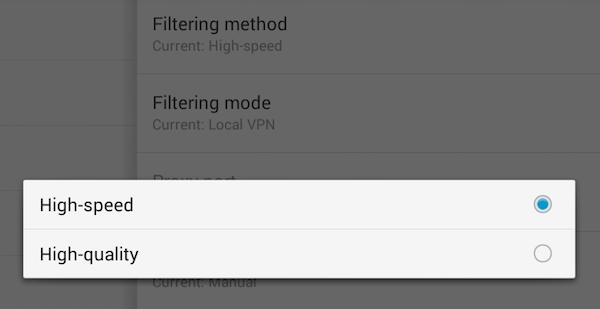 This filtering mode is used by default. Its huge advantage is that, when you use it, the application does not require ROOT access. At the same time VPN-server is located on your same device, so that there is no need to pass the traffic for filtering through a remote server. 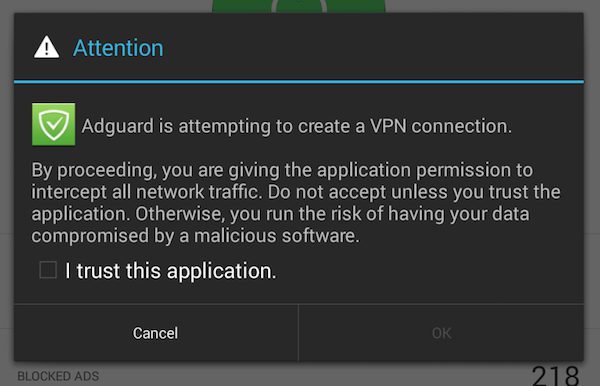 When the protection is on, Android will ask you for permission to enable VPN. You’ll have to confirm your permission every time you start the application. Unfortunately, this is Android limitation, and there is no way to get rid of it. After the protection is enabled, you will see a system notification about launched VPN. Adguard will monitor the status of your network connection, and will automatically restart the VPN if the network connection is lost. In this mode Adguard launch a local HTTP proxy server that process and filters traffic that is passed through. We recommend using this mode in two cases. If you are using a device with ROOT. If you want to use Adguard along with any third-party VPN. If you have ROOT access, then filtering will be enabled automatically, and will not require any additional actions from you. Unlike in VPN, you do not need to constantly confirm and authorize Adguard’s work. If your device is not rooted, then you will need to configure proxy settings manually. Configuration process is described in details in FAQ section in the very program, so we won’t be telling you about it in this post. We just want to note that you will have to change this setting for each new Wi-Fi network, which is actually quite tedious. Another significant disadvantage of manual proxy mode is that only Wi-Fi traffic will be filtered. Configuring proxy for the mobile network is not possible. 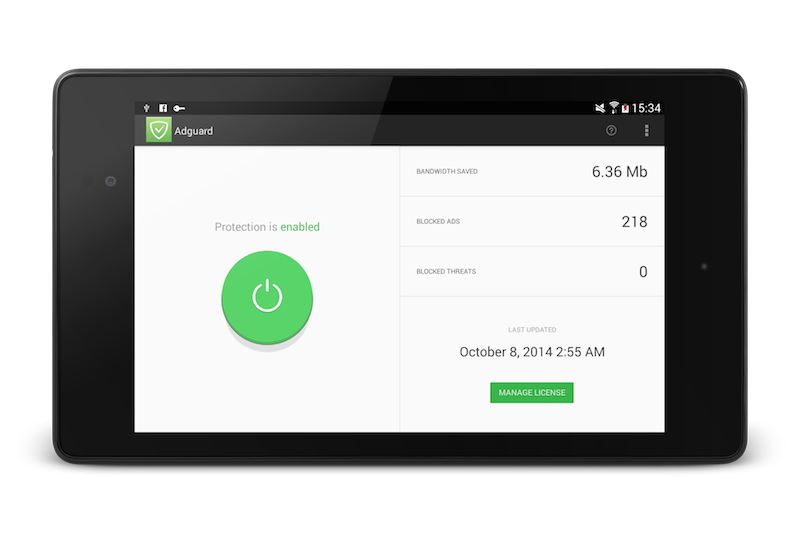 Adguard will work on all devices with Android version 4.0.3 and higher. Unfortunately, the Android platform imposes some limitations on us. We will list them all. We can not filter secured HTTPS (SSL) traffic. In Android it is almost impossible to properly decrypt that traffic, so Adguard will not filter websites which use HTTPS. Adguard can not filter traffic in browsers that compress traffic. For example: Opera Mini, UC Browser, Puffin Browser. The only browser that we can filter despite its traffic compression is Google Chrome. Basic Adguard for Android functional (i.e. ad filtering) is totally free. You’re more than welcome to use it :). If desired, you can use the additional premium Adguard for Android features for a small monthly fee. Please note that the subscription applies to all devices that are activated by your Google account, for which you purchase subscription. Protection against malicious and phishing sites. Improved ad filtering. Premium users get better ad filters. Also, these functions can be activated by Adguard Premium license key, which can be purchased on our website. Instead of purchasing a subscription, you can activate it with a license key. We do not plan to divide licenses for the platforms. Therefore, our licenses will fit all versions of our product: Adguard for Windows, Android, and Mac OS X (when it’s released). Closed beta continues. Anyone can apply to join. Participants of closed beta are the first to get all the updates. What to do if you found a problem? If you encounter any problem, please tell us about it. This can be done right from the program using the **Send feedback message **in Support section. Along with the message an additional information for troubleshooting will be sent. How to install Adguard for Android? There are two options to install Adguard for Android. The standard way of installation: you can download Adguard from Google Play. In this case, Google Play will take care of updating Adguard, and you will be able to buy a Premium subscription. Another way is to install Adguard as a standalone apk. Full description of Adguard installation process as apk is available on this page. If you use this version of Adguard, another premium feature will be available – ad blocking in applications. By the way, if you have purchased a subscription in Google Play, it will work in this version too. We’re not going to stop here. We have many plans for the development of Adguard Android version. Here is the part of them. Development of Adguard Assistant analogue for mobile devices. Adding the support of IPv6. Adding the function to install userscripts to Android version. We really appreciate your opinion on Adguard. As you know, we always listen to our users, and try to do what you ask us to. Please write to us all what you think about the program. What you like and what you don’t, and what is missing in your opinion.